Our trials and tribulations of the two year old year! Today was the big day!!! I longed Corky for about 20 minutes. She was FULL of energy! I spent some time ground driving her to get her thinking. Then Janet came out to hold her, and I did the big deed - I climbed in the saddle! Corky never even noticed (yea! The diet is working LOL!). I swung my feet around, patted her all over, and shifted my weight a bunch. Then I slid off, and climbed on again...still no reaction from her. I had Janet walk her forward and backwards a few steps just to feel my weight on her back when she moved. She didn't care at all! This is a great sign. Look at the photo - she is wearing 2 of my Christmas gifts from Kevin - new Professional Choice boots and a new girth. Very comfy...she likes it a lot better than the old hard leather girth. 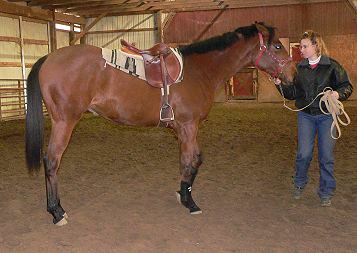 Her official height at the start of 2006 is 16 hands 1/2 inch at the withers, and 16'1 1/2" at the hip. She is 19 and a half months old. We did another longeing session today, and I sat in the saddle once again. This time I had a friend lead us in a small circle...just one! Corky seemed at bit confused by my shifting weight on her back as she walked, but she stayed calm and didn't mind it a bit. I will give her a few days off, and try again later in the week. Our biggest battle right now is keeping her steady on the correct lead when cantering on the longe line. She constantly switches her back lead and I have to correct her. Once in a while we will get several rounds at the canter on the right leads, but more often than not she will go 4-5 strides and then switch her back lead. I notice she tends to pick a spot and switch every time she passes the same spot...strange! She is getting very heavy on the longe line also...really pulls hard if I don't have the chain. I need to find a way to lighten her up again and keep her from leaning on the halter. Corky has had the past week and a half off, just some turnout. there hasn't been anyone at the barn to hold her for me to get on, so I opted not to take a chance by myself and just let her have some free time. Today I longed her with the saddle, and she was much lighter in the halter. Bill held her while I got on, and she was as good as gold. Bill led me around the arena on her for about 5 minutes and she could care less! I moved around a lot, shifted my weight in the saddle, and patted her all over to get her used to the sensation of someone on her back. She honestly didn't even act like she noticed, until I leaned down to give her a hug around the neck. She just kid of lifted her head, then relaxed again. Have I mentioned lately how much I love this horse? I have a new sidepull on order (my old one is waaaaay to small for her head), and once it arrives I will start ground driving with it and eventually try a solo walk around the arena. No rush, though...we have all year! Today was my second solo ride on Corky, and I have the pictures to prove it! She did well, no problems at all! I am using a bitless sidepull bridle (with the noseband wrapped in a heavy soft cotton). I want to put off using a bit until I absolutely have to...hopefully well into the summer. We practiced some showmanship today. She is really getting the hang of the 360 degree pivots. She did well with setting up today, though it takes a long time (she tends to move her foot way too far when you cue her). She gets better at the 360's the more you do them. I always have to remind her first to move away from me, then eventually I can get her to swing her shoulder and pivot just off of my body motion. 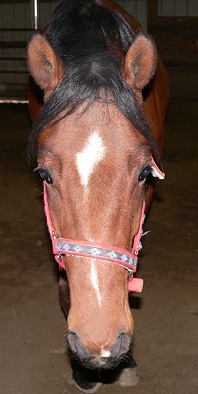 Her patience isn't the greatest yet, so it's hard to judge if she will be a good showmanship horse or not. No, I haven't forgotten about this training diary! Corky has basically been on free turnout for the past few weeks. Between the cold weather, being sick, and trying to get Taylor in shape, I put Corky on the 'back burner' and let her have some free time. She needs this play time! Hopefully next week I will start doing more with her in regards to riding. I hate waiting this long between sessions, I will probably have to sit in the saddle and start from scratch. Oh well, she's only 2 so there is no rush...we have all year! I had the time today to longe and work Corky...finally, after 3 weeks! She was a bit more energetic under saddle, but did very well. Snow was sliding off the roof on one side of the arena, and the tractor was outside on the other side digging up the manure pile, and she never noticed a thing. We spent quite a long time walking circles, figure-8s and serpentines, and stopping and standing still. Watching her on the longe line today took my breath away. She is such a natural, floaty mover. I measured her yesterday, and she grew again! 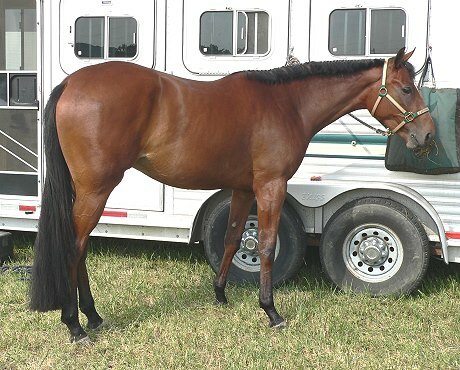 She is a solid 16'1" in the withers, and 16'2" at the hip. She is so well-proportioned, she doesn't look that big, but once you walk up to her and stand, she looks like a full-grown horse. I tell you, work really gets in the way of my horse life! Finally today I had a chance to spend time out at the barn (other than just cleaning stalls) and work with Corky. She longed well, and I did more walking with her under saddle. She definitely feels stronger and more energetic with me in the saddle. Several times I could feel her really wanting to break into the trot, but I used slight pressure on the sidepull to keep her at a walk. We did tons of circles, and worked on walking straight lines down the center of the arena. She walks a line like a snake LOL! I longed Corky today. She was all fired up because I rustled a plastic bag when I entered her stall. This is SO frustrating! How could a big horse like her turn inside out when she hears the rustle of plastic? I spent a good 20 minutes in her stall crinkling that darn bag while she flipped out, ran circles, and about fell over several times. It looks like I will need to hang another half-dozen Diet Pepsi 2-liters covered in plastic bags from her stall ceiling. On a good note, I was reading through past entries of this diary and I noticed that one problem we were having now seems to be gone. She really isn't pulling on the longe line at all anymore. I am not sure why she started doing that, and then all of a sudden stopped. I tried to keep her from turning it into a tug-of-war contest with me, and instead of putting pressure on the line I used light, annoying jerks on her halter when she pulled. It must have worked, or else she just decided to be nicer to me. I made Corky stand for the bags again. She was marginally better, but it was still a battle. I guess this will now be a daily lesson we will have to do. Today it was rather warm (55 degrees) and pouring rain. The rain was deafening on the arena roof, but Corky could care less. That's a great sign! I longed her for a while, and then climbed on. We did more walking, circles and serpentines. I worked a lot on stopping her with leg pressure. I am using some of the lessons I learned with Taylor of trying to get her to stop with more leg/seat pressure than reins. She was slowly getting the hang of it. She doesn't have a lot of patience when standing still...after a few seconds she seems to think it's time to walk again and will usually try to step out. That will come with time. For the first time, she jumped a little under saddle. We were walking quietly, and she stopped and shook. I think the feeling of me in the saddle when she shook startled her, and she jumped forward and hoped a bit! It only lasted about 2-3 steps and then she was back walking quietly. I forget that everything is still so new to her - my weight in the saddle feels OK as long as things are centered and balanced. I need to do more moving around and shifting in the saddle to get her used to me not always being centered (because you know I am not a perfect rider and I get off center a LOT!). Today I put her tail up in a sock for the first time. I know, sounds stupid to even be writing about it, but every little milestone counts when you are writing a training diary LOL! Some of her turnout-mates are starting to chew on her tail (on NO!) so I put that stinky M-T-G stuff on it in hopes it will deter any more feasting on her tail. ON another good note, a tiny bit of hair started shedding off when I brushed her...spring is almost here! I rode Corky yesterday and today. Yesterday I started using leg pressure to turn her in circles. Today it seemed like she was catching on to moving away from my leg. Success! I also stared asking her to drop her head down occasionally when she lifted it very high. I am not really asking for a headset yet, but asking her to be flexible and drop to a relaxed level when I ask. She was pretty confused by what this all meant. I had more success dropping her neck down a bit when we were curving or in the corner...I guess that's normal. I am trying to put a bit of a leg-stop on her (not calling it spur stop since I don't use spurs!). Now, she will stop and stand still with my leg pressure and the word 'whoa', with minimal rein pressure. Soon I need to start her in a bit...I will wait till the weather stays warm so I won't have to subject her to an icy bit her first few times. Today was Corky's first ride in the arena with another horse (Rocky, my friend's Skys Blue Boy 3yo gelding). She never paid him a single bit of attention. It was strange, it was like she didn't even see him! She did pay a lot of attention to a friend of mine sitting in a chair by her stall...now that was alarming! I have been doing a lot of circles and steering with leg pressure, and she does really well with that. Today she was laying her ears back a little bit at my leg pressure (although she did everything without asking twice). I think she might be coming into heat...she seemed so sensitive to her sides. Well, we will know in a day or two! I longed for about 5 minutes and then rode - she had been turned out all afternoon so wasn't raging with energy. Corky was, however, raging in heat. I was interested to see how she would act under saddle in heat, because on the ground she is pretty disgusting. She rode very well. We did a lot more circles and serpentines with leg yielding. She is also becoming a bit more consistent with her head. I am just gently asking her to drop her neck to somewhere near level whenever she puts it way up in the air, and she is catching on quickly to my signals. Things are almost going too easily...I am wondering what is in store for the next month that I am not prepared for (LOL but that's just me - when things are going good it is time to get paranoid!). I am so tempted to trot, but not until May 1st. I don't want to trot until she gets used to a bit, and I don't want to start putting a bit in her mouth until the weather warms up. This weekend it was 30 degrees and snowing, so I will wait a bit longer. Have I mentioned how much FUN it is breaking this horse? It's the last day of March! What a beautiful day, 70 degrees and sunny. I have been doing a lot of short rides on Corky. She is really doing well, although she is so sensitive she HATES leg pressure. It's going to take some time for her to just get used to my calves pressing on her sides. Today was another 'banner' day in our training progress - Corky wore a bit for the first time! As usual, I dreaded this day thinking it would be a major battle...and as usual it was totally no big thing to her. Of course, a lot of our bending and steering training went out the window as she 'protested' against having the pressure in her mouth from side to side. Today she did a lot of balking - stopping and not wanting to go forward. I noticed a bit of this yesterday when I rode her in the sidepull, but today she had a bit of a sullen attitude. She will get tomorrow off and we will see how her attitude is on Sunday. I rode with the bit again today. Corky tried several times to pull the bit and the reins out of my hands by resisting when I lightly asked her to bend her neck and turn. Putting pressure on the rein only made her pull harder the opposite way. Small, light tugs of pressure worked best - keeping my hands very low and guiding her head around. I have to keep reminding myself to be PATIENT! She has to learn to give in to the bit, it doesn't just happen overnight. By the end of our ride she was doing much better. By using a combination of leg pressure and light rein pressure, I was getting her to drop her head and walk circles and serpentines. I am keeping our training sessions short - to about 15 minutes a day. My number one goal is to have Corky keep a good working attitude about being ridden. She tends to get impatient and crabby sometimes (not unlike her owner LOL!). Well, I went to the barn only to clean stalls but ended up in a marathon training session. I had the wheelbarrow in front of Corky's stall and was cleaning it out, when the plastic bag I had with me scared her senseless, and she attempted to leap the wheelbarrow to escape. She made it over, but did scrape up her back leg (the one without the bone infection scar...figures!). Once I caught her, We spent a good 20 minutes desensitizing to the plastic bag. By the end of the session I could rub the bag all over her, but she was still a ball of nerves and a bit wild-eyed. This is getting so tiresome, she should be used to bags by now (I have one having in her stall from the ceiling and she bumps into it all day), but every day it's the same repeated lesson. I rode Corky again today with a bit. When I first got on, she was extremely stubborn about turning - the minute I'd put a little pressure on one side, she would pull with all her might to the other side. I could see a huge battle looming ahead, so I did the smart thing - I dismounted and started working her from the ground. This was the smartest thing I could have done (something SO simple, I should have through of this from the start!). I stood on the ground and gently (with very gentle pressure) used the rein to pull her head and bend her neck to one side, I did that several times, and then switched and pulled to the other side. I spent about 5 minutes doing this (and stayed very quiet throughout the whole procedure), and Corky started dropping her head and giving in to the slightest pressure. Then I got back in the saddle and did some circles and bending. It worked! She dropped her head and willingly bent and turned for me. This was one of those 'DUH!' moments...I will make the bending from the ground part of our regular routine before riding. No matter how many horses I have broke and trained, I always learn something new with each one! Every day is a new day! Today I rode Corky again, first time in about a week. I only longed her maybe 5 minutes, I wanted to see how she was fresh under saddle. She acted very good. I was amazed at how light her mouth was suddenly. It's as if a light switch flipped on, and she suddenly only required the barest touch of a fingertip on the reins to make her turn or drop her head. I am not sure what suddenly brought this about, but it sure is nice! We did a lot more circles and serpentines, and I worked on teaching her to carry her head level...which is so natural for her to do, it makes the training easy. I couldn't resist! Corky rode so well again today, I decided to try her in a trot. This really threw her for a loop - she was very confused and a bit unsettled by my shifting weight when she went into a trot, and she kept stopping. I ended up having Janet stand behind her and wave a longe whip to get her going again. We did several rounds at the trot, and she was wonderful! She dropped her head and didn't seem to have any trouble carrying my weight. Janet said she looked just as good under saddle as she does on the longe line, and this thrills me - so many horses lose their pure movement when you put weight in the saddle. I am a week early in my plan since I was not going to trot her until May 1st, but she was more than ready. I am getting more and more excited about this horse! I trotted Corky again today. The first time I asked, she went into it with a little urging. The second time, she just flattened her ears and refused to move out fo a walk! I even used a short crop and tried urging her that way to no avail. I had to really whomp on her with my legs a lot. I think we walked an entire round before she finally got back into the trot. I praised her a LOT while we were trotting, and think she figured out that this was the correct response. I did a few more trot rounds, and each time I asked it got a little easier to get her into the trot. Corky sure lets you know when she is unhappy about something - those ears are like neon signs advertising her mood! Oh, and I measured her today. She is nearly a month shy of her 2yo birthday. She measured slightly over 16'1" at the withers and just about 16'3" at the hip...no wonder she felt so downhill under saddle! Yesterday and today I did more work trotting under saddle. I am only riding for about 15 minutes at a time. Today I asked a little more of her in regards to giving her head and bending. I am very happy with her progress. I had Caitlyn video my ride today, and watching it was very educational. 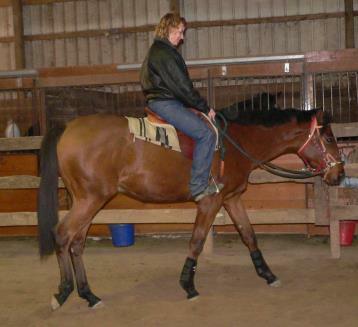 Corky looks awesome - what a nice floaty, toe-pointing trot under saddle! Corky is starting to take advantage of my good nature on the longe line. I finally got angry today and put the chain over her nose to keep her from pulling my arm out if it's socket. All it took was one set-down spanking and she immediately went back to her 'good' behavior of leaving a slight bit of slack in the longe line. On the opposite end, under saddle I think I discovered I was asking a bit too much too soon from her. 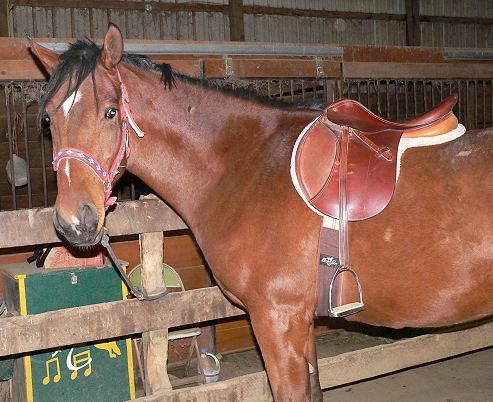 She is so big and strong, it is easy to forget that she is only 2 with just a bare minimum of riding experience. We went into the trot (still had to strongly encourage her to go into the trot) and I was really getting after her expecting her to stay near perfect with her frame. She was getting very frustrated, and I had to stop and think. Time to back off...I have only been trotting her one week!!! I relaxed and didn't expect perfection...just asked her not to put her head in the sky but travel easy and she calmed down and did much better with a lot less fight. I can see this will be a battle for me - to constantly remember that she is a 2 year old and not to expect her to do everything right every time. Today I rode Corky in the arena with Allegro (Bill was riding her). I was curious to see how she would react with another horse trotting past. Her main reaction was to stop when Allegro came close. Eventually she was figuring out that she wasn't going to get run into, but she still was a little touchy. This will come with time. On a positive note, each time I asked for the trot today she went right into it with minimal encouragement! Now I will give her a break for about a week or so, and start up again next week. I gave Corky a couple weeks off since I was busy with Taylor's show season and other things. Bringing her back to work was interesting! Her first reaction to the trot was to balk and slam on the brakes. For about the first 2-3 rounds she kept trying to balk. Eventually she gave up. 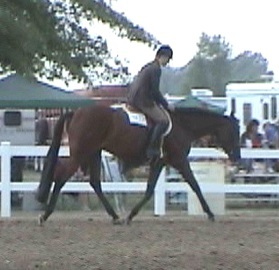 She started trotting this huge trot, we were just flying around the arena. I let her go as big as she wanted (her steps weren't fast, but her stride was massive!). I think she discovered that it's FUN to trot big...she immediately stopped balking. I rode her yesterday and today. She'll get another day off, and we'll continue the work over the weekend. Then Monday it's a nice long road trip to Stacey's to ride and have her give me some pointers on my training process. Corky has never been ridden outside of our arena, so that will be a fun experience! 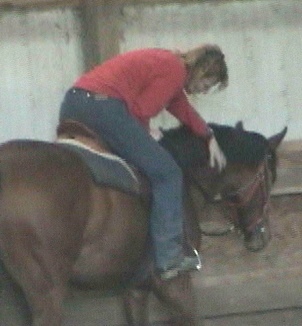 Yesterday, Corky was quite the brat under saddle - balking and just testing me to see if I really meant for her to work! I tried riding without longeing, that was probably a mistake. She was full of energy and wanted to play. So today I tried a different tactic - I had her turned out all morning with her buddy Allegro before I came out to ride. She and Allegro played HARD all morning. That was the ticket, because she was excellent under saddle. She definitely needs her play time before going to work! am still only riding her for about 15 minutes at a time. Monday we will be heading for Kentucky. Today she got a bath, got her ears clipped (NOT fun! ), and practiced loading in the trailer (no prob!). We survived the 5 hour trip to Stacey's! Corky was a bit reluctant to get into the trailer, but she did with a little coaxing by me. 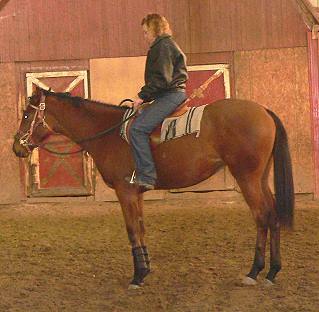 When I arrived, I let her settle in a stall for a while and then rode her in the indoor arena. She was a bit wide-eyed at all the new sights and horses, but stayed very calm throughout the ride. She was very forward and tended to barrel through the bridle. Stacey gave me some great pointers and teaching her to rate her trot speed according to my cues...and it seemed to work! Tuesday I took her out to the outside arena and rode. This was our first ride outside! She was a bit calmer than yesterday, but was very hard to keep focused. I let her relax in a stall in the indoor arena all day (where she could watch the activity). Tuesday evening I got her out again to ride in the indoor. Stacey had been encouraging me to try her at the canter all day, but I wasn't brave (or crazy) enough to try it outside! I put her into the trot and she was so wonderful...beautiful cadence and really listened to me. I pushed her along and then cued her to canter, and she went right into it! I think I cantered every round with a big smile on my face, it was an awesome feeling! She drives so deep underneath herself that it was very hard to sit (but that's a good problem to have - I just need to develop more balance and strength!). 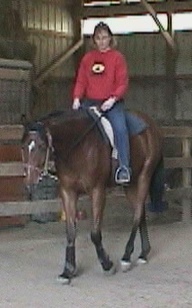 It was great - our first canter under saddle...a Hallmark moment!!! I should mention that after the very first time I asked her to trot on Monday, she never once pinned her ears or balked, she was very willing to move forward off of my leg into the trot. Her ears went flat back at the canter, though, but she stayed very willing and cantered off each time I asked her. I know it was tough for her to canter with my weight in the saddle, and I was so proud that she still stayed quiet and pretty and balanced herself as best she could. She is such a strong candidate to do the 2yo HUS stuff this fall. 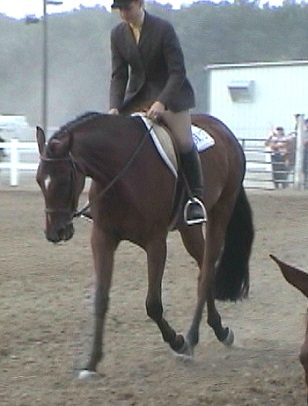 I have never been a fan of showing 2 year olds, especially in hunter under saddle. But then I've never had one as strong and as natural as she is. There are some big opportunities available to us this year if I choose to take them. Decisions, decisions! I don't have much money left in the show budget to do anything really big, and I am just not sure pushing her would be the right thing to do at this time...but it sure is tempting. I have a lot to think about these next few weeks. Oh yes, and I measured her with the really nice accurate measuring stick with the level...I couldn't believe it. She is 16'1 1/4" at the withers, and a whopping 16'3 1/4" at the hip - still a full 2" off, but she is just about as big as Taylor from behind! She has none of that gawky, leggy young look - she looks very fit and strong with good bone. This is so exciting!!! I gave Corky the rest of the week off after our long journey to Kentucky and back. I expected her to be a bit bullheaded today with all that free time, but once again she surprised me by riding excellently after only about 3 minutes of longeing! I rode at the walk and trot for a while, and then asked for a canter. he surprised me by popping right into it on the first cue (out of the trot). She is very unsteady and all over the place at the canter, but she does it naturally low-headed and slow-legged. How great it will be to not have to train those two elements...they are 100% natural! I rode for about 15 minutes, and then called it a day. No sense in pounding her right now. Tuesday will be her very first chiropractor appointment. I wonder if he will find anything out of place yet in her back. I figured it's never too early to start keeping an eye on those precious vertebrae! Show season is in full swing, which means that Corky's training time is minimal. That's OK, she doesn't need to be pushed right now. I rode her today, first time in almost a week. She did well, but really was testing me at the trot. I opted not to canter today, because she seemed so tense. Maybe I need to wait a bit until she relaxes more before cantering...I don't want the whole riding thing to be a big source of stress for her. Then again, I am probably spoiling her! I have done a lot of work with Corky this week. On Wednesday, I rode her and videoed my ride despite the fact that she was VERY much in heat and got angry every time I put any leg pressure on her. I sense she is another candidate for ReguMate...oh joy! She was very bullheaded and full of attitude today. Great day to video...NOT! Yesterday for the first time ever I rode her outside in the outdoor arena. Our outdoor 'arena' is really just a very large dug-up dirt area in the middle of the 5 acre pasture, so there are no fences or boundaries right around the arena. Holy cow, Corky acted like she completely forgot how to steer! She was not bothered at all by all the new sights out there (even the neighbors jumping in their pool next door didn't bother her), but she was very revved up by being outdoors in such a wide open space, and not having a fence to guide off of made her think that she could go wherever she wanted! We had quite a ride, but I got her back to where she was before, and even cantered her out there! I can see we have a lot of work to do in places like this. Today was our big day - I hauled Corky to a small open show across town to longe her and ride her during the break and expose her to show sights and sounds while in the saddle. Sadly, she was very sore in her right hind heel. It looks to be an abscess getting ready to blow. Poor thing! So I scratched my riding plans and just spent the day leading her around the arena and all over the grounds. They had two breaks and I led her in the arena and let her check out the traffic and other things. She was amazingly good! Nothing at all seemed to bother her, she walked quietly beside me the whole time. I was very proud of her, because you just never know what a 2yo will do when getting out for the first few times! What a bummer I couldn't ride her. Of course this abscess (or what I hope is an abscess) happens the day before I am leaving for a week (to teach at band camp). Looks like I will be spending several evenings on the phone calling to see how she is doing. All in all, it was a good day and I am totally EXCITED to start showing her next year! I have been gone all week at band camp, and finally made it out to the barn tonight to see Corky. I think this is the longest I have gone without seeing her since last year's band camp and vacation. She did blow a small abscess out of her heel on her right hind foot, but is completely sound on it. I haven't ridden her in a week. She did everything right, but had a bit of an attitude at the first canter - she kicked out really hard at my leg and hit the fence. I did scold her for that, and she took it to heart and was much better behaved the rest of the evening. She really needs to get into a regular work program. I just don't have the time to be able to work her consistently every day...and Tuesday I leave for a 2 week vacation. Well, in August we will buckle down and do some consistent riding. She is so much better when she is kept in 'work mode'. Taylor is the same way - loves her vacation time but is a real bear to get back on the program and back to work. I am finally back from vacation! Corky did well in my absence (I think she grew some more!). We went right back to work tonight, despite the 95 degree heat with high humidity. Just as I thought, she was very bullheaded after having almost 3 weeks off. I did get 2 very nice canters out of her - probably the nicest yet. Thankfully she had been turned out most of the day, and between that and the heat she didn't have a ton of energy. I spent a lot of the ride trying to 'rate' her - making her trot at my pace instead of just going as fast as she felt like going. She had been doing pretty good at this back in June, but I expected to do a lot of re-training after having a month off, so I am not worried. Today was the big day - Corky got her first shoes! Her feet have been cracking up badly, so I decided to have front shoes put on her to protect her feet during these hot, dry months. I was a little apprehensive - you just never know how a young horse will react to having her first shoe nailed on her foot. I shouldn't have given it a thought, she stood there perfectly! It didn't seem to bother her at all. My farrier was very patient, and stayed very quiet around her, so she had a great experience. She looks so grown up with her front shoes on. I will give her the day to get used to them, and tomorrow I will ride again and see if anything is different in how she moves with shoes. I hope not! I returned home around 3am from Kentucky, having hauled Corky to Stacey for a few days to ride and get some training advice. I did both trips - to and from - in the middle of the night to avoid the near 100 degree temperature. I was SO proud of Corky! She behaved like a seasoned horse...nothing at all bothered her! We worked on bending and loosening her up in the front end so that her shoulders could be lifted easier. Corky is also becoming more of a veteran at hauling (after two 5-hour trips to KY). She is more patient in the trailer, and really enjoys attention whenever we stop for gas (she's very popular!). We outlined some goals for next year and a basic training plan. I am extremely excited! Oh yes, I measured her again with the good stick and level. She grew! 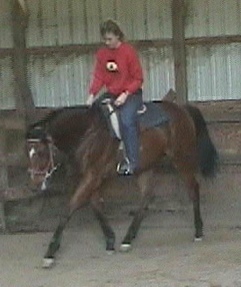 She is now 16'2" in the withers (grew an inch there) and 16'3 1/2" at the hip (grew 1/4" there). Big girl! ARGH! Horses are SO frustrating. After Corky had been SO good last week in Kentucky, I did not expect her to be such a wild witch today under saddle! She spent all of her energies working against me - leaning on my leg and my hand and just being bad. I guess everyone (even horses) will have those days occasionally. It sure is frustrating, one step forward and two steps back sometimes. Today was the big day! Yesterday I hauled Corky to an open show and rode her around at lunch break. She was very quiet (although she gave a good display of bucking at the canter! ), so I made plans for the next day. Today we got up early and I banded her mane and cleaned her up. We headed to an open show at the Mercer County Fair for our walk-trot debut! When we arrived, Corky was a bit on edge (there was a lot of commotion around, being a county fair). She settled quickly after about 15 minutes of longeing. I put Taylor's fake tail on her, it didn't look half bad! We rode during the lunch break, and this rattled Corky a little bit. She didn't know what to make of all the horses coming and going in different directions. It was a great experience for her. Nothing outside of the arena seemed to bother her. She looked at a few things, but never spooked. What a fun ride that was...riding a non-spooky horse! Once we got into the walk-trot class, things went very well. Corky relaxed with the horses all going in the same direction. Most of the class was filled with western riders, and their slowness calmed her down. There were 34 in the class, so they did two splits and a finals. Amazingly enough, we actually made the finals! Though we didn't place (she was a bit inconsistent with her head and with her speed), I was EXTREMELY proud of her! 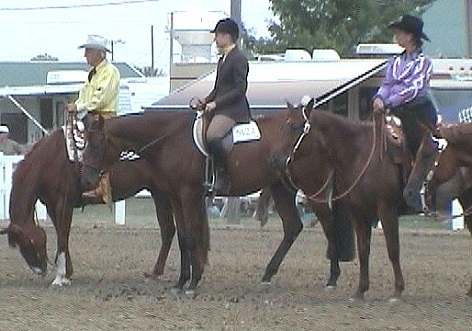 We went back into another walk-trot class that had 8 in it, and we ended up 2nd...Corky's first placing under saddle. What a great debut for a 2 year old's first show! I am so excited for our future. Dang horses! Just when you think things are going great, they turn on you! Today I decided to longe and ride outside. It was a beautiful day - 80 degrees, sunny, and low humidity. The horseflies came out in full force, and although I showered Corky in flyspray, they were really bothering her. Being the nice person that I am, I took her back inside to ride. Wow was she bullheaded today! We spent quite a long time just trying to rate the trot - she wanted to trot like it was a race, and I had to sit back and half-halt her and keep asking her to slow her legs down a bit. I forced my posting to slow down, and it helped (although my legs are still burning from that!). When we went to canter, her attitude came out in full force. I battled with her a little bit, asking her to relax and bend. When she had a big tantrum and kicked the wall while cantering, I finally got mad enough to really discipline her. Bingo! She then gave me a super nice canter for about 2-3 rounds. There's my wake-up call...I am being too nice to her again! One problem I noticed at the canter is that when we are cantering to the left, she has a hard time doing a straight line. She is constantly turning her body trying to do a circle. It was tough to keep her straight on the straight walls. We did a lot of work on this using a lot of leg and rein pressure to ask her to go straight, and eventually she figured it out. I quit after that good lesson...quit while I am ahead! All in all, it was a rather rough day of training. I think she was just reminding me that although Sunday went really well for us, we still have a long road of work to look forward to. It was a great way to knock off my cocky confidence LOL! I rode Corky again outside on Thursday evening - no flies, low humidity, perfect weather. Unfortunately NOT a perfect ride! This was probably our worst ride ever. I left feeling very discouraged. She was just full of herself this evening - constantly worked against me. She wanted to do every gait as fast as possible, and when I would take up some pressure to ask her to come back, she would turn her head upside down and fight. the canter was especially bad - at times she was rocketing sideways completely out of control. Of course, after I rode I found out she was flaming in heat, so that could be a big part of the problem. The biggest hole in our training appeared, I guess. That hole is the fact that she is fighting pressure rather than giving in. I wasn't asking her to drop her head to show level, but just asking to give to the pressure, slow down, and get her head out of my lap! Staying easy and level was OK for her when we were in the small enclosed indoor arena and it was her idea, but out in the open, she had other plans. Today I didn't ride, but I put on some side reins to her bit and asked her to longe a bit. They weren't very tight, but the caused her to feel the pressure (much like my hands) if she tried to flip her neck upside down. I ended up turning her loose in the arena for this work session so the longe line wouldn't interfere with what she was doing. Holy cow....talk about a temper tantrum...Corky went absolutely ballistic when she felt the pressure. She started running backwards and fighting. I let her relax, and encouraged her to go forward and stay relaxed. Eventually (it took about 15 minutes or so), so would walk forward calmly while giving in to the pressure. We then did a little trotting and she stayed relaxed. Every now and then she would lift and hit some pressure and slam on the brakes and fight, but then immediately gave in. The nice thing about this lesson was that she was fighting herself, and not my hands. I am hoping that bu doing a little bit of this each day, she will start to give in when I apply pressure rather than fight. Tomorrow evening I will ride, so we shall see if this lesson helps! I free longed Corky this afternoon with side reins. I loosened them so that they only put a little bit of pressure on her if she turned her neck upside down. She did very well, only slammed on the brakes once. We worked at the walk and trot only. I took the side reins off and rode her at the walk and trot. I had a set of draw reins attached along with my regular reins to be used if she flipped her head up. She never once tried to fight the bit, so I never had to use them! All ion all it was a very good ride. We stayed in the indoor for our ride. Tomorrow evening I hope to try riding outdoors again and see if our lessons hold when we are away from the walls. Yesterday was another not-so-good ride indoors. Today I decided to head outdoors and do some longeing first outside, then ride. Corky was excellent today! She only tested me a few times, but backed right down and went back to work. The greatest thing was that I was able to 'rate' her - ask her to slow down a bit and hold her speed. We are making progress! I didn't canter her, I haven't cantered her all week, just worked at the walk and trot. Sometimes you have to take a step backwards to make forward progress. Yesterday we went to the Allen County Fair to an open show. There was plenty of commotion and lots of horses. Corky could care less about the commotion! Today was more of a training day for us. 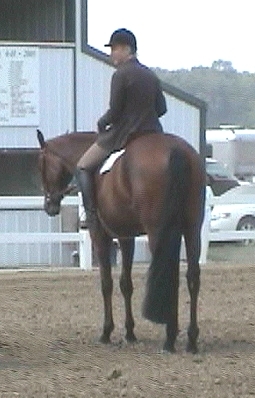 We entered the first open walk-trot class and I used that class as a training exercise to make her come back to my pace. She tended to want to speed down the rail when she saw all of that room ahead of her. We entered a second walk-trot class (adult) and in this class I gave her a little more trust to see how she would handle herself. She did great! We ended up winning the walk-trot class, Corky's first win under saddle (Hallmark moment LOL!). It was a long day with lots of saddling, riding, unsaddling, then re-saddling, riding, etc. Today I gave her a day off. I went out to the barn to clean stalls, and to wash her tail. Corky hates having her tail washed, but she put up with it for my sake. Afterward, I turned her out in the arena to play. After yesterday's long training day and today's tail-washing moment, you would think the last thing she would want to do would be to hang around me. But amazingly enough, as soon as I turned her loose and started walking to the door, she followed me! I stopped several times and she stood right at my side with her nose at my shoulder. She followed me all the way across the arena and to the door. You know, I have never fed this horse treats or anything like that to make ehr want to follow me around. She just felt like being with me. What a grand feeling! I love this horse!!! Today I rode Corky, knowing that tomorrow being the first day of school I oprobably won't have the energy to do much else! She rode very well until I decided to canter her. I haven't cantered her in several weeks since I was working on other issues. Immediately her head came up to evade the bit, and we were all over the place. I ended up putting the draw reins on her...I hate to do it but I need to get a little control over her face so I can control her movements. Wow, what a difference. After she hit the draws once, she came down and cantered a beautiful, slower-paced canter several times around the arena without putting any pressure on the draws at all. All it took was a little pressure once or twice and she was giving in. 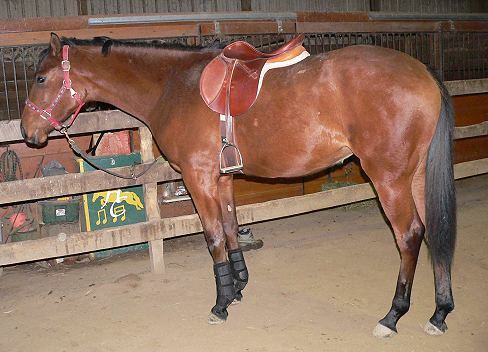 FINALLY I found that nice nice nice canter under saddle that I have been watching for 2 years now on the longe line. I knew she could do it...just had to make her see that this was her job to do it and not fight. Afterwards, she once again followed me around, holding no grudges. Too bad everyone I deal with in life isn't this forgiving! Nothing much to report today, but I did bring Corky to the crossties to clip for this weekend. I decided to take my time and see if I could introduce the clippers near her ears without having to use a twitch. It took a lot of time and patience, but I was able to clip a lot of her ears and her bridle path with only a little resistance! I took my time and would clip a little hair, and then when she stopped pulling away I would take the clippers off her ear, always making it my idea to pause the clipping. She got calmer as we went along. It helped that I was having an especially patient day (which is amazing since it is the second day of school and already I am exhausted). I will do a little bit of ear clipping every day. My goal is to make her like Taylor - completely clippable without a twitch. Yesterday I rode Corky after she had been turned out with Allegro for several hours. I just hopped on and rode, since she really didn't need any longeing. She was very ear-pinny today. She kept trying to balk a little and pin her ears at my leg pressure or when I was asking her to move out. Finally I got after her a bit for the attitude and it improved immediately. It seemed like all I had to do was get a little angry and show her that I did not like that attitude, and she relaxed her ears and became more willing. We cantered today (with the draw reins). Going to the right she was just about perfect - ear were flopping relaxed (first time at the canter she didn't act angry!) and it was nice and slow. When we cantered to the left, she kept trying to over cant - canter sideways with her head towards the wall and her hip thrown way in. Now where the heck did she learn that...I never had her do that!!! It was difficult to make her canter straight, but finally I got through to her and it worked out. Strange! Today I longed for maybe 5 minutes and got on (she hadn't been turned out yet). Immediately I noticed a difference in her attitude today - VERY willing and none of the ear-pinning at the trot. Maybe it is because she was fresher today, and more tired yesterday? I am not sure, I will have to keep track of this and see what makes a difference. Possibly it is because I rode her a second day in a row. She always seems more full of attitude after I give her several days off. I rode without draw reins today, and the canter was a bit wild. She wasn't flinging her head in the air (thank goodness!) but she was really cantering big and fast and it was hard to sit. I felt like I had zero control, the thing controlling her was the arena wall. I want to avoid using any sort of draw reins or training aids if at all possible. I will try again tomorrow, and then give her several days off during the week. We took the time to work some showmanship today. I think setting up will be our biggest challenge. She really is mastering the pivot rather quickly! She is very dull with the halter cues, and it is tough to get ehr to move the correct foot and only move it a little bit. I am sure this will take some time to teach, and my plan is to do a little bit at the end of every riding session. Today I put a western saddle on Corky for the first time. I thought she would be bothered by the heavy stirrups banging on her sides, but she really didn't pay much attention to them. 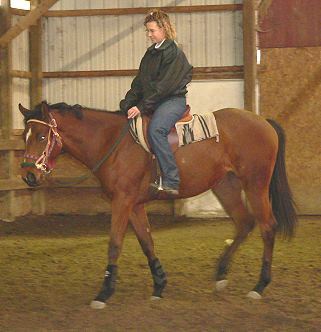 My main goal was to relax in the saddle and make her relax at the canter. The western saddle gave me more security in my seat (and a place to grab onto!). I just let her go at her own speed, which was considerably fast. My purpose was to get her out of the habit of the hippity-hop canter that is impossible to sit to. This was better, but I still can't sit to it! My lack of riding ability is frustrating me. fter our work session we took a ride out into the back pasture and went to visit Fruit's grave. I figured she might want a visit from her baby. It was sad, the grave was still dirt with no grass, even after almost 4 months. I miss her. On a good note, our showmanship practice went very well today. Corky is really getting the hang of the pivots. Today I got her to set up on cue 4 times! That is a huge accomplishment because this has been a big roadblock in our training all summer. I have discovered she is opposite of Taylor - with Corky the hind end is much easier to set than the front end, and she is better if you leave the left hind planted and move the right hind to square up. I rode Corky in the western saddle again today. On our first canter attempt, she threw her head straight up and went all over the place. I hoped off and grabbed the draw reins. I must be able to control her head at least enough to keep her from flipping up and taking control! I still felt like the canter was totally out of control. Janet came out to watch, and went back in to get her video camera to video my cantering so I could watch. Man, I was amazed. My perception is all out of whack. Corky has SO much drive and power at her canter that I cannot sit to it, and it feels like we are flying when actually she is moving with a beautiful, slow-legged gait. It wasn't perfect or even, but it looked far nicer than what I had thought. I definitely need to get regular videos so I can see what we are looking like and keep my perceptions honest. On Wednesday Corky had her feet trimmed and new shoes put on. She had been turned out all day with Allegro (who probably ran her ragged) and she was a bit gimpy when I brought her in. On Thursday, she was very stiff in the front end. I noticed some slight swelling and heat at the bottom of the tendon in her right front leg. I hosed it off and put some tightening liniment on it. Friday and today I hosed it again with cold water. Today it looked much better and she was moving on it fine. I definitely want to keep an eye on that tendon! So, no riding for us this weekend. I rode Corky today - first time in 3 weeks. I gave her some time off to make sure that tendon went down, and then Taylor came home and I have been concentrating on preparing her for Congress. Today I finally had enough time to ride both horses. It is so weird to get on Corky after riding Taylor. Wow, I never realized she was SO incredibly downhill! I felt like I was riding a roller coaster on the way down! It was funny - at first she humped and bucked a little on the longe line as if she was just getting used to the saddle again. Then she settled down into her normal routine. She actually rode really well for me considering she had 3 weeks of just turnout and no work! Even her canter was better. Maybe the time off is what she needs. 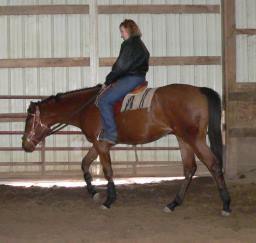 I rode in the western saddle and was able to work the canter better. We even did some walk-to-canter transitions. It's fun seeing Corky and Taylor being turned out together. It's hard to tell who the 2 year old is. Corky has a lot more body than Taylor, and is only about an inch shorter at the hip. I wonder how big she will end up maturing to? Corky got another long break, I finally had a chance to ride her again. Yet again she acted jumpy when I first put the saddle on her, but she settled down and actually rode wonderfully for me! I fully expected to have a bad ride - or at least a partially untrained one. I mostly walked and trotted, but I did try a canter one direction. She was pretty good! Tomorrow I will do a little more riding and try to get her back into the work mode. Saturday I rode Corky. She acted a bit bullheaded for a while. It took some time to remind her where to carry her head and how to move off my leg. I did a lot of walking in between trotting and cantering - working on leg yielding. I even tried some work on a hindquarter pivot. She about nailed it going to the right, but had no idea what to do going to the left. I think this stems form the preliminary showmanship training I have been giving her - she is fairly good at pivoting to the right on the ground. I will start teaching her to pivot to the left in preparation for the pull turn and pivoting under saddle. Sunday I did quite a bit more canter work. She is SO much stronger and more balanced than she was a few months ago when I was frustrated with her canter. We had some very nice moments at the canter today! The nice thing about Corky is that she is so naturally slow-legged...not in a hurry to get anywhere. This makes cantering such a pleasant exercise. If anything, I have to push her a bit with my seat and legs to keep her rounded and forward-moving. I am starting to get excited for next year, it is starting to look very promising! Corky gave me a frustrating ride today. She was very 'angry' at the canter, tried to fight me a lot and just acted like she was trying to test me. It's one of THOSE days! VERY frustrating ride today! Our trotting went very well, and I was feeling more positive. But it seems we took a major step backwards at the canter. She even reverted back to balking at my leg. I think she bucked more in this ride than she has all summer. They weren't hard bucks - at least she is so slowlegged that her bucks are fairly easy to ride though!. She just had the attitude today that she did NOT want to work! At one point I was so frustrated with having to force her to keep going forward that I put her into a big hand gallop and galloped around the arena a few times. That actually was a good idea, because our next canter round was much more forward and easy on my leg. Training is SO hard sometimes. Sometimes I feel like I am blind and just feeling my way though all these issues. I wonder who is training who? I certainly have never had such a talented and difficult horse as Corky to train. I guess the old saying is true - the good ones are always tough. Well...she will get tomorrow off and we will try, try again on Sunday. OK, I feel better today. Corky was much better. Her trot was VERY locked in, I swear I didn't even have to touch the reins for most of the ride. I love how I can steer her with my legs so easily. Being so sensitive in her sides is good in that aspect. At the canter she first tried to buck and kick out a bit. I really got after her and pulled her around and restarted her. She was much better after her little scolding. I'd say she did the canter work with hear ears pretty relaxed almost half the time. That is a definitely improvement over Friday's ride! She wasn't so 'angry' today. I am wondering if maybe she was in heat last week...that could explain the sudden shift in attitude. Taylor was in heat, so it is a good possibility that Corky also was. That would be a good excuse!!!! One step forward, two steps back. Corky was really testing me today. Our trot was great, but at the canter she tried a new trick - diving her head down to pull the reins out of my hands. We battled for quite a while on this - I was NOT going to let her get away with this trick! I think she met her match - finally after about 30 minutes I got a nice canter both directions that was smooth, controlled, and her head stayed relaxed. I hate that I have to fight with her sometimes to make my point. She takes such an aggressive ride, so different from Taylor. But man, when she finally gives in and rides right, she is incredible. She is one horse that has pure legs and movement - I don't have to do a thing to get that right. I just have to work her mind more than anything. This has been a real learning experience for me! Well, she will get a couple days off and we will try, try again later in the week. Oh yes, I almost forgot to post this video footage of her canter, taken on Oct. 30th (last week). This was on one of her 'less happy' days, but her legs look great! I did ride Corky on Friday. She trotted like a champion! 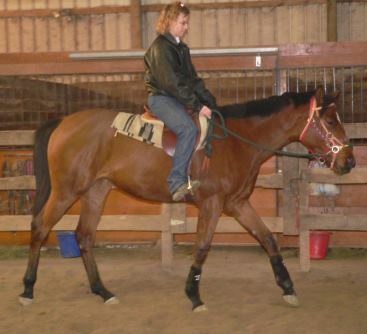 Her first canter was probably the best I have ever gotten out of her - relaxed, smooth, and steady with no attitude! I was SO happy! Of course, the next few canters were FULL of attitude. But...at least I got one good one out of her! Today we did some videoing to see where we are at. She gave me a fairly decent ride with a few moments of brilliance! Her trot is really locked in right now. I have been doing a little bit of cantering from a walk and she is catching on well today. Today she picked up the correct lead every time, which is a first for us. On Friday that was a big problem for some reason. Corky is on a diet right now. She has gotten so fat! She is a very easy keeper. Finally today I noticed her becoming a little bit trimmer...my saddle was slightly easier to cinch up. Yay for working diets! I rode Corky last Monday and then gave her the rest of the week off. Today was a much better day! I had a good talk with Stacey on the phone about the problems I am having cantering her and what she is doing when we reach the corners (balking, etc.) and she gave me some good suggestions - one being to use my outside rein to help support her around the turns. I did that today and there was a definite improvement! The first time we cantered, she got balky in the corner again, but I used leg pressure to ask her to move on and used my outside rein - lifted to hold her outside shoulder up around the curves. I think she figured out she can make that turn at the canter while still keeping her forward motion! Yippee...progress...finally! 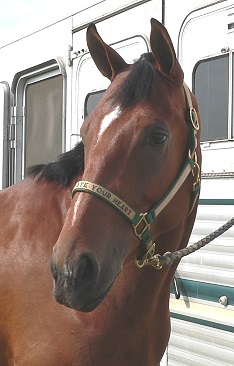 This coming weekend I am hauling Corky to Stacey for the weekend to get some lessons and advice. I want to see more progress with her, and I feel we have really been stagnating lately. She certainly is a different one...so incredibly talented and yet so different to train. I think we are i>both getting an education! I woke up to snow today...yuck! Today was one of the first days I was very cold out at the barn, one of many more to come. Corky is nice and fuzzy now with a very plush coat. Today we saw some improvements. She started of a bit rough, full of p*ss and vinegar and attitude. But the more we worked, the more relaxed she became. The last few canters were actually very nice! I had a very casual ride with her today, with little pressure. I did a lot of walking and conversing with Demi who was riding Taylor. Corky has been more relaxed riding with Taylor lately sicne we have been doing it so much. Today was a good no-pressure day...I need to have more of these! I got up bright and early (5am!!!) and hauled Corky and Taylor to Kentucky for some lessons and help from Stacey.We started off Saturday afternoon trying to ride outside. It was sunny and 70 degrees! What odd weather for late November, but I am not complaining!!! Corky was wild - not in the sense of spooking or excess energy, but in the sense that she did NOT want to work and was going to fight me every step of the way. We ended up going inside where there were four walls to hold us in. She bucked so hard with me I swear I thought I was toast. Every time I put a leg on her asking her to canter she would erupt into bucking, and would buck any time I put any sort of pressure on her. It was terrible! She has NEVER been this bad at home!!! Gone were the easy, rocking horse bucks...these were back-cracking double barrel bucks. I rode her for about 45 minutes while Stacey watched and gave some advice. Sunday we got up early and rode again. It went a little better. She wasn't bucking quite as much but still would buck when I cued her to canter. My problem was I was disciplining her by pulling her to a circle towards the middle, which was the direction she wanted to go anyways (think: reward!). Instead, I started pulling her towards the outside, using that outside rein to bend her the opposite way she wanted to go as a punishment. I guess I was being too ice with her, letting her buck and riding through it. Now is the time I need to set the standards and punish her for aggressive bucking and let her know this is not acceptable. Something Stacey had me work on was doing a two-track at the walk. This not only taught Corky to accept my leg pressure, but it also helps position her body correctly so I can get a better canter transition. This is going to take a lot of work with her, because she was VERY resistant to my leg pressure at the walk. Strange, because I can turn circles and serpentines at the walk just off of my leg, but asking her to walk straight in a diagonal off of leg pressure really made her mad! We gave her a break and then Stacey got her out in the afternoon to ride her. Right off the bat Corky tested her by trying to buck and Stacey got after her immediately. 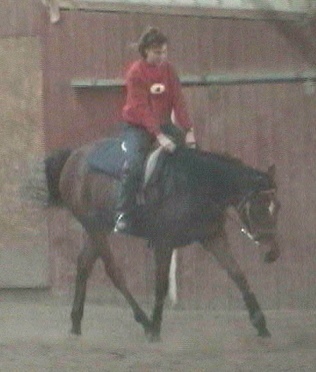 The amazing thing was that within minutes she put her into the nicest, smoothest canter I have ever seen out of Corky. Grrrr! I have it all on video and need to watch and see what exactly she is doing so differently from me that got that response from Corky. We ended on a good note today with some decent rides, so I was feeling a lot more positive. I have a LOT to work on - two-tracking, using more outside rein at the canter, and NOT letting her exhibit bad behavior anymore. It's time to teach her how to behave like a lady LOL! On another good note - Corky hauled wonderfully the 5 hours there and back, and was very well-mannered at Stacey's. She didn't spook or seem to be worried at all at her strange surroundings, which is a wonderful thing! SUCCESS! I thought today would be a bad ride after Corky's bucking antics all weekend, and the fact that today she was RAGING in heat. Today ended up being one of the ebst rides I have had on her to date! NO bucking whatsoever! I spent a lot of time at the beginning of the ride doing what Stacey told me to do - lots of two-tracking at the walk to get her to move off of leg pressure and get used to the feel of my leg against her barrel. Her canters were wonderful today. We only had one tiny moment where she kicked up at my leg, I immediately got after for it and went on, and we had no more incidents the rest of the ride. Interestingly, she was very sucked back at first and lost a lot of her forward motion, but I got her through that. I wonder if being in heat had anything to do with that - that hasn't been a problem for us in weeks. I left today with a very good feeling. I was feeling worried after the weekend and all the attitude and bucking she did, but it seems she is over that (for now!). So, until the next moment arrives...I will enjoy the good rides! Today was a fantastic ride. You know, other than a few small incidents, Corky has been good as gold since we got back from Kentucky! I don't think she has bucked once...isn't that odd? Today was our best ride yet. It was VERY cold, about 25 degrees (yes I am CRAZY! ), and I let her and Taylor run around the arena for about 20 minutes before I saddled and rode. She was VERY stiff in the neck and body. I hadn't ridden her since last Sunday. I did a lot of bending at the walk for the first 15 minutes or so. At first when we trotted she got very attitude-y whenever I'd put any leg pressure on her, so I walked her into the middle and lightly banged my legs on her over and over again until she relaxed. Then the ride went great - her canter was very relaxed and easy to ride...I don't think I had to touch her at all at the canter! It was so much fun. What a great feeling to go home and thnk about this ride - we are really making progress. Oh yeah, and while standing and looking at her I realized she looked very uneven again. So...I measured her! 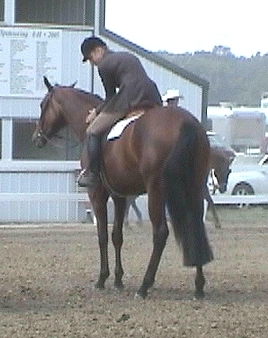 Withers are still the same, but the hip has grown to a full and complete 17 hands tall. Amazing...as a 2 year old! She doesn't seem that big when you are in the saddle. She is so short-backed and big boned. But when you walk up and stand right next to her then you can really see the height. I LOVE THIS HORSE! Have I mentioned that lately? I rode Corky yesterday and she was great. Actually reverted back a bit to her balky habits. I had to push push push with my leg to keep her going (and that's not always a bad thing, believe me!). Today I pulled out the English saddle. Time to start riding 'for real' again! It felt odd at first - she is pretty downhill right now. But once we got going, it felt great. Every ride starts out the same - I have to do a LOT of bending to warm her up, and we go through about 10 minutes of "I don't wanna work" "Yes you DO!" "No I DON'T!" "Work, dammit!" "No!" "WORK!" "Ok, I'll work!". Then after we get past the little 'discussion', she settles down and is wonderful. Today was great. Her canter was soft and round and soooo easy. I can remember a few months ago when I rode in the English saddle it was SO hard to sit to. 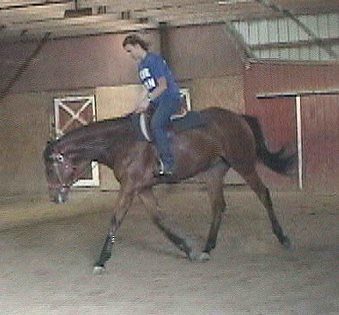 Now her canter is much more balanced and steady. Today I am excited for the future. I have such big big big plans for her. I sure hope she agrees to them! Well, with every up day comes a down day, right? I was flying high because I had some GREAT rides on Tuesday and Thursday. It all came to a screeching halt on Friday when Corky decided to resurrect her attitude and decide she did not want to work! We worked through the issues, but today was worse. She was very balky and ear-pinny, and spent a lot of time trying to do the opposite of everything I asked of her. I was very frustrated and more than a little upset. Time to regroup and figure this out. She gets a couple days off while I think things through...see if maybe this was a mare-in-heat moment. She is probably getting ready to come into heat (Taylor is once again in full blown heat and she tends to be about a week behind). I am keeping a close eye on her cycles and her moods, she has some major PMS issues! Major attitude and lack of work ethic right before her heat cycle, but once she is in heat she seems to settle and relax and do okay. We shall see - if she comes into heat this week I will make note of this and keep track of her cycles. On a good note, the weather has been outstanding - high 40's to mid 50's all week (and more of the same next week). You gotta love surprising good weather in December in Ohio! 2 more weeks and I will have to start a new page - Corky's 3 year old training diary...my how time has flown! I had ridden Corky last Monday and it was rotten. I gave her a few days off and watched closely for signs that she might be in heat. No dice, it doesn't look like she is. Darn! that would be a good excuse as to why she has been so witchy lately. Yesterday was a busy day for both Corky and Taylor. In the morning both had their feet trimmed and reset, and then in the afternoon the equine dentist came out. Corky got both of her wolf teeth pulled, a few caps popped off, and an all-around float. She will be much more comfortable with her wolf teeth gone. Today was a wonderful, warm day - 54 degrees at the end of December! We started off the ride with a bit of attitude, but as the ride went on she relaxed more and we did finish up on a positive note. Today had some very nice canter transitions. She was much more forward-moving and wiling to canter off. I eased off on the pressure I was putting her under to round up and give her head. I let her relax at all 3 gaits and just asked her not to put her head up in the air, but keep it at a relaxed level. Between that and having those wolf teeth gone, she became much less tense and stopped fighting with me. So YES, we have progress! The progress was very small but it was still there, and that's all that matters. Hard to believe that in just a little over a week I will have to start page 3 of our training diary - Corky's big 3 year old year...the year of dreams! I am hesitant to really dream quite yet. We have a LOT of work to do. The potential for greatness is there, but the question always remains - will I be able to bring it out of her, keep her happy and sound and trained correctly? We shall see! I didn't ride Corky today, instead I spent some quality time on Taylor remembering what FUN it is to ride a well-trained horse! The good news to report: When I turned Corky out I noticed she was in heat! Yippee! That PMS thingy could be a cause for her rotten attitude all last week! You have no idea how thrilled that makes me. It's nice to have a reason for her attitude...a reason that can be easily fixed with ReguMate. he'll have the next couple days off, and then I hope to ride her on Christmas day...we shall see how it goes! I rode Corky today, and she was pretty good. She was definitely feeling better and in a better mood on the ground with me. She looks to be completely out of heat now. Under saddle we had a few moments of attitude, but the more we rode, the better she got. I have to keep reminding myself to be PATIENT. We go through the same issues the first 15 minutes of our ride every day. I just need to stay patient and quiet and deal with then each time and work through them. I rode for just under a half hour. Hard to believe - just 4 more days of her 2yo year. Tomorrow we are hauling over to a friend's plce to ride and have a 'two year old training party'. It's so nice to have someone to go ride with and help each other out. So many people are so darn competitive, it's hard sometimes to find a good friend that doesn't resent any success you might have. It's been an exhausting, heart-wrenching 24 hours, that's for sure! I came out to the barn at noon yesterday the get ready to load up and head to a friend's to ride Corky, and found Corky out in the arena lying down with Taylor was nervously circling her (Taylor was very upset ALL day, like she knew her pal was hurting). I just thought Corky was laying down, and I pulled her back up, and she took 2 steps and her legs crumpled. I immediately started calling vets, and the only one that was available is the local vet. At this point I didn't have much choice, and it still took him an hour to show up. My friend and I walked her and it was all we could do to keep her on her feet. I tell you it was the longest hour of my life, watching her go down over and over again. He tubed her, refused to palpate her because he said she was 'too young'. Huh? She's an almost-17 hand horse that poops baseball-size manure...I could drive a TRUCK up in there let alone just an arm! Anyways, with some banamine and oil, she seemed more comfortable and he left. After about 3 hours once the banamine wore off, she started acting uncomfortable again. This time my friend Janet called another vet that was about an hour away, and he headed right out. He did palpate her, and he was the one who found that her colon was misplaced (from all that rolling) and had flipped up over her spleen. He put her on an IV and gave her medication that would shrink her spleen. This took about 30 minutes, then he had me long trot her on the longe line for about 20 minutes to see if the colon would slide off the shrunken spleen and go back into place. He palpated her again and the colon hadn't budged. This is when he told me my last resort was to head to Ohio State ASAP. They could put her in a sling and manually turn her upside down to try and flip the colon. If this didn't work, our last chance was to go in surgically and move the colon. He have Corky a tranquilizer and I called Kevin and begged him to ask the girls if they would go with me, which of course they did. They were awesome, chattered the whole 2+ hour drive and kept my mind off of things. When we got there, the ultrasounded her abdomen and found that in the trailer ride the colon finally did slide off the shrunken spleen and back into place...hoooray! She was incredibly bloated with gas, like an oversized balloon. They went in with a tube and manually released the gas (I swear to you it sounded like and explosion!). They tubed her again, and took her blood levels. She was very dehydrated, so they put her in an ICU stall hooked to an IV for the night. The girls and I got a hotel on campus. At this point it was after midnight, and the last thing I had eaten was toast at 9am!!!! We ordered a pizza and ate it at 1am. Thank goodness for credit cards. I was NOT prepared to be staying the night, I still wore my riding clothes with 3 layers on, had nothing with me! The hospital called me early this morning to tell me she was doing better, and they were going to give her some hay. If she passed manure, then I would be able to take her home in the afternoon. She finally did pass manure (kept us waiting long enough! ), her first manure in 24 hours. I pad the bill (ouch) and we headed home. She was very wound up when we got home, and acting almost normal again. Doc's orders are stall rest with handwalking only for 3 days, and then back to regular work. I am exhausted, but SOOOOOO glad it worked out without needing surgery. What an emotional roller coaster. All I could think about was how Fruit died from Colic just 6 months ago. It would have killed me to lose Corky right now, she has become so important to me! Today we hand-walked around the arena. It was actually an enjoyable afternoon, spending a completely stress-free day with Corky just walking around. I washed the million gallons of mineral oil out of her tail, and we did a little grazing out front. I practiced a little showmanship with her. She really has her pivot to the right going well. Setting up isn't so smooth, since she hasn't grasped the concept of moving a foot a little bit....she tends to move it about 8 inches at a time. I haven't really done a lot of showmanship work with her, so I need to start making this a part of our daily routine. Someday Taylor (my ultimate showmanship machine!) will retire, and I'd like Corky to be able to try and set into her shoes. I do have that cool new outfit that needs to be worn some more. It was a nice day. I kept looking at her and thanking God that she is alive and healthy. Now I just have to worry about paying the hospital and vet bills. Tomorrow starts our three-year old year, the year for futurities and Congress. I wonder what the future holds for us? Will we be successful? I am sure there will be a lot of struggles as I attempt to mold her talent into a good show horse. I will just pray for no more disasters or vet bills!